Home Blogs dlnadmin's blog SQUARE END TIES? Our Madison Avenue showroom is quintessential New York City. From the crown molding, to the solid wood cabinetry, we maintain a certain classic look. With that said, you can only imagine our surprise to the latest trend in ties – The Square End Tie. Throughout the last century, Oleg Cassini and other designers took a liking to this style of ties, and today the younger generation, with their interest in vintage and ‘back in the day’ looks, has embraced and brought back the square end tie. To us, the ties looked too casual initially, and dare we say, too young. It reminded us of our childhood, but it was like seeing someone from our past. We didn’t know how we still felt about them at first. What did draw us in was the elaborate and unique materials that the ties were created from. 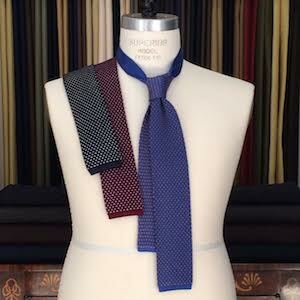 Square End Ties tend to be on the flimsier side, which gives them much more of a casual look. Although they look great under a suit jacket, these ties are a great way to add a distinct look to an outfit without a jacket. After some consideration, it became apparent that any initial apprehension to the tie probably came from its boldness. It does draw eyes whenever it is worn, with whatever it is worn with – and that is why we brought it into our showroom for Fall 2014, in an array of fine knits.